So, I wake up with about five minutes to go in the Wings-Flames game and the score 1-1. At the start of the season, I would have told you that this was Tomas Holmstrom‘s last season with the Wings, that he was injury-plagued and wearing down from the constant beating this brave warrior takes every game in front of the net. But it was Holmstrom’s goal with 1:19 to play in the game that gave the Wings this critical 2-1 victory; it was his screening presence in front of Calgary goalie Mikka Kiprusoff that helped, if not assisted, Pavel Datsyuk score on a power play with 50 seconds left in the second period to tie the game at 1. Game #69 (13 games to play, 26 points), 80 points, 8th place, 3 points ahead of the 9th-place Flames, 1 point behind 7th-place Nashville, and — dare we think — 4 points behind 6th-place Colorado and 5 points behind 5th-place Los Angeles. What I liked about the game: In addition to Holmstrom, how can you not mention Jimmy Howard, who stopped 22 of 23 shots, including a penalty shot. What I didn’t like about the game: Waking up at almost midnight to catch the end of the game … Brian Rafalski‘s double minor for high sticking. That’s two games in a row that Rafalski has been careless with his stick. The BIG question: Well, Todd Bertuzzi is a big man, and he carried the Wings for a few games offensively earlier this season. But it has been 17 games since he last scored a goal. To his credit — and there are many who would have doubted it possible — Big Todd is playing well away from the puck and not taking stupid penalties in the offensive zone. — Mike Babcock on Bertuzzi, Dan Cleary (no goals in 11 games) and Valteri Filppula (1 goal in 9 games). It’s not all about the Wings: I agree with the Alexander Ovechkin suspension, and I probably would have given him more than two games (sorry, Nate Ewell). It isn’t that Ovie didn’t push the Hawks’ Brian Campbell hard, it’s where he pushed him in relation to the boards. “He fell bad,” Ovie said. Yup. And you pushed him — does Ovechkin know how strong he is? — in a bad place. Ovechkin has great ice awareness. He plays hard, with passion. The hit was careless at best, dangerous at worse. Mood meter: Sleep deprived but happy. Maybe Homer can give his teammates lessons? This isn’t going to be easy, is it? In fact, this may not happen at all, eh? The Wings may miss the Stanley Cup playoffs for the first time in almost two decades. You can see it, right? I mean what was that third period Tuesday night IN Hockeytown other than an early tee time? Up 2-1 after two periods IN Hockeytown, and you get outshot 14-4 in the third period and give up three unaswered (as in: hey, is anyone home?) goals for a 4-2 loss. I’ve written earlier on this blog that whether the Wings make the playoffs this spring or not, this same team will not make the playoffs in 2011. This Lidstrom-Datysuk-Zetterberg era is over. The Wings are dead (remember them)? Long live the Wings. Game #66 (16 games to play, 32 points), 9th place, 1 point behind 8th-place Calgary, 3 points behind 7th-place Nashville (which won Tuesday), 4 points up on 10th-place Dallas. What I liked about the game: Tomas Holmstrom scored a goal and an assist. 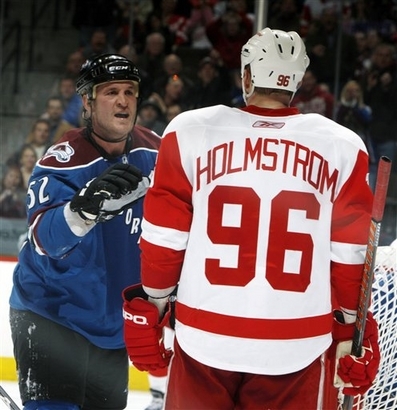 What I didn’t like about the game: No Wing was a plus player, not even Holmstrom. Obviously, I didn’t like the third period collapse — or the fact that the Wings trailed 1-0 for the first 30 minutes. The BIG question: Simple: making the playoffs. Mood meter: Cloudy in Miami. 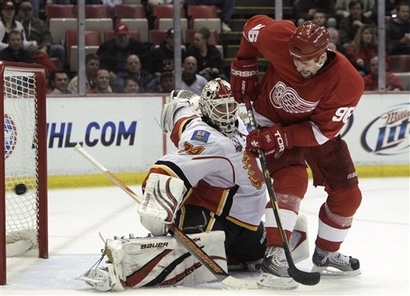 Back in the office: Tomas Holmstrom sticks his rear end in a goalie's face. Sorry, but 10:30 p.m. is too late for me to stay up for a hockey game most nights. But, if I go to bed early enough, I tend to wake up late in the third period, which was the case early this morning. The score was 4-2 Red Wings with about five minutes to go. But I have seen that 2-goal scenario fade into disappointment before — and recently — and wouldn’t you know it, off goes Nick Lidstrom of all people for hooking (of course) at 17:32. San Jose came on like, well, like Sharks, but Joe Thornton, who had scored the Sharks two goals in the first 10 minutes of the game while I was still blissfully asleep took a penalty just 23 seconds after Lidstrom (you should have heard the San Jose colorman complain! ), and the Wings weathered the storm (note to my Sports Writing & Reporting students: “weathered the storm” is a cliche; don’t use it). So, I blissfully returned to sleep with pleasant thoughts, as opposed to dreams, of three-straight Wings victories over the Sharks. Game #56: 64 points, tied for 7th with Nashville but with one more game played than the Predators. The 6th-place Rockies are 4 points away (and with a game in hand); 10th place is only 3 points in the rear mirror. Make sure you check out the game photos by Jed Jacobsohn/Getty Images on Yahoo Sports. He had a great night! What I liked about the game: Besides waking up to a 4-2 Red Wings lead and missing the Sharks get off to a 2-0 lead, Detroit scored two power play goals. Did I mention that Tomas Holmstrom was back in the lineup and had two assists? And Jimmy Howard made 32 saves. Let’s not start to take him for granted, eh? What I didn’t like about the game: Late games on West Coast swings. 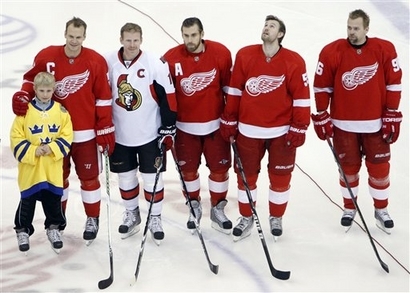 Why aren’t the Wings in the Eastern Conference? In search of: Johan Franzen and Andreas Lilja: They’re the only two Red Wings still out of the lineup (although Niklas Kronwall tweaked his ankle and will likely miss Wednesday night’s game against Anaheim) after a total of 264-man games missed by Red Wings this season to date. The Sharks, in comparison, have missed 128. What is: The Wings are getting healthier. But that doesn’t necessarily equate with playing better. The returning players need to get back in game shape. The team needs to recalibrate it’s chemistry. This remains a team that finds scoring challenging. I gotta mention: The Caps have won 11-straight games! Good for them. … J.S. Giguere debuted for the Maple Leafs last night with a 3-0 shutout against the Devils; happy to see Giguere in the East. … Phoenix, Colorado and Los Angeles, all teams that were not supposed to be playoff contender but are ahead of the Wings in the West, all won. Mood meter: I slept well.